(DJ) Sermeq is one half of the Bloe Baaschtert team, the guys bringing you your weekly dose of local music on Radio ARA, and he also used to be the singer in the analogue-only keyboards band Schweinepest. 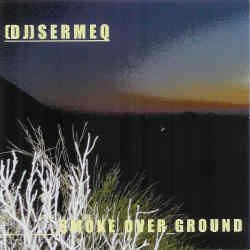 Due to several reasons, that band broke apart, forcing (DJ) Sermeq to create his own project, and an astonishingly professionally done debut CD. In fact I expected the worst after hearing his less than satisfying contribution to the disastrous More Songs For Life compilation, but on Smoke_Over_Ground, he fortunately chooses not to sing. Wise decision! The opener Radiophonic sounds like processed short wave transmissions, the following Valentina is just as far from getting you into romantic territories, with warbling keyboard sounds and distorted effects in the background. It's only with Antidynamic where the prefix (DJ) starts to make sense, combining danceable techno beats with cold synth sounds, making you feel like raving somewhere on top of an iceberg. kAOs is also rhythmic, but less groovy, again more distorted, a trait that ends the first half of the CD with the grating Mystic River. I don't know what happened from there on, because Dimension4 has much more discrete rhythms, and a certain early-Eighties Kraftwerk feeling to it. Very soothing. The Way Down is again a dance piece, with cool sounds never knowing if they want to be a beat or a keyboard, coming over like a glockenspiel from outer space. The pièce the resistance is the final From Greenland, 8 minutes of splendid soundscapes, owing a lot to early Seventies synth hippies like Tangerine Dream and Klaus Schulze. Smoke_Over-Ground is not always an even piece of work, and yes, there are blasphemous traces of digital sounds (unlike his past with Schweinepest), but I admire the depth and width of genres that are done on this album. With two truly great songs and a rest of good to excellent stuff, this is a must have for every friend of innovative electronic music.